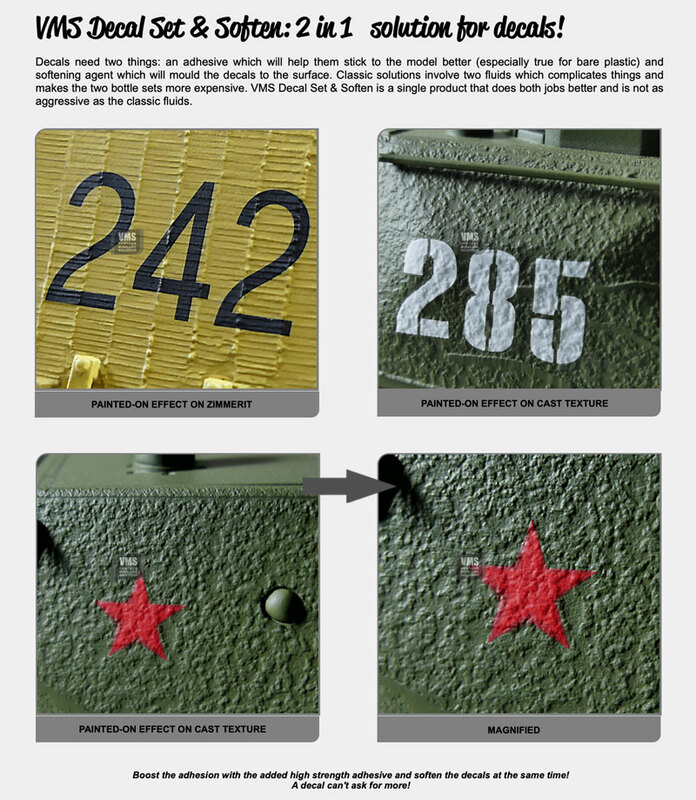 Decals need two things: an adhesive which will help them stick to the model better (especially true for bare plastic) and softening agent which will mould the decals to uneven surfaces such as panel lines, bolts, weld seams, zimmerit or cast textures. Classic solutions involve two fluids which complicates things and makes the two bottle sets a more expensive affair. 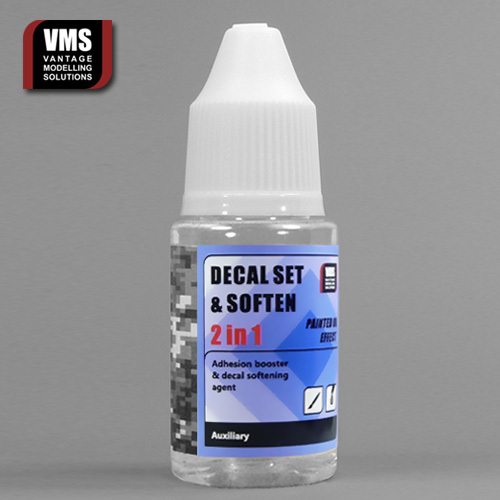 VMS Decal Set & Soften is a single, 2 in 1 product that does both jobs better by giving fantastic adhesion with proprietary adhesive formulation while being less aggressive than classic softening fluids minimising the possible damage to paint coat. How to use the fluid (thin decals)? ​- Makes sure your paint coat is 5+ days old. ​- Apply a drop of fluid over target area and place your decal over so prepared area. ​- Allow 45 seconds for the decal to absorb the fluid, then press the decal to the surface and squeeze the excessive fluid and. ​- Use brush soaked with water to neutralise the excess decal fluid and wipe the area clean away as seen in the video. ​- Mould the decal if necessary using a cotton bud. How to use the fluid (thicker decals)? ​- Make sure you are dealing with thick decals by conducting the 5 minutes as shown in the video . ​- Soak the thick decal on the surface of decal fluid for 10 minutes as seen in the video. ​- Press the decal to the surface and squeeze the excessive fluid and. How to know my decal type (thin vs thick)? ​- Conduct the 5 minutes as shown in the video . How effective is the fluid? ​​- One model requires around 0.5-1 ml of fluid depending on the decal amount, bottle holds 30 ml. You will be able to finish around 30-60 1/35 scale models before you run out of the product. ​​- Plain water is enough to clean the brushes. How long do I need to wait before I can varnish my model? ​​- Wait 24h - the decal will achieve the best fit over this time.